Magpies’ Gift Wrapping Adds the Perfect Finishing Touch! 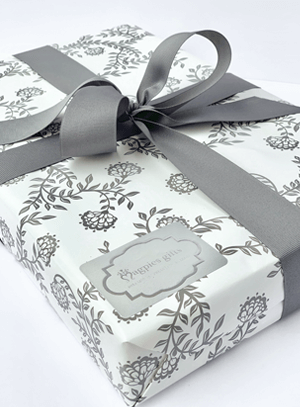 Make your presents pop (and make life simpler) with Magpies Gifts’ signature gift wrap! Our ladies are experts at transforming your gifts into pristinely-wrapped presents. Gift wrapping is available both online and in-store! Wrap includes tissue paper, wrap, ribbon and a Magpies Gifts silver foil sticker. We regret that extra-large items cannot be gift wrapped. If you have questions about eligibility — or anything else related to our gift wrapping service — please feel free to contact us.